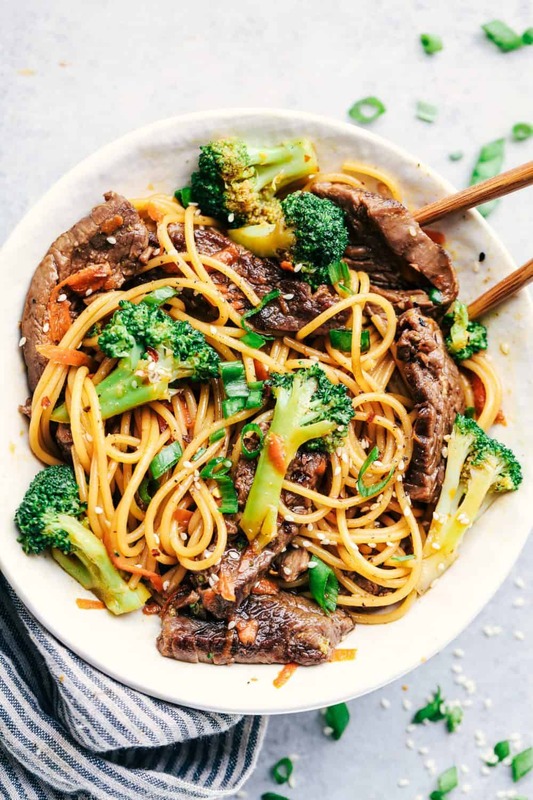 20 Minute Garlic Beef and Broccoli Lo Mein has melt in your mouth tender beef with broccoli, carrots, and noodles. The sauce adds such amazing flavor to this incredibly easy meal! School is starting for us next week! Have you seen that meme that says, “I know that school doesn’t start for a week, just walk slow.” That is my favorite meme. The kids are going stir crazy and its time to get our lives back. Am I right? 😉 This summer did fly by for us with a new baby. I can’t believe it is already time to start. We always go the weekend before school starts to Park City for one last hurrah. It is absolutely gorgeous up there! We love to do our school shopping at the outlets, stay in a really fun place, and end with the alpine slide. The alpine slide is always something my kids look forward to every year. It was a fun family outing and was enjoyed by all! With school starting, I will be bringing you some quick and easy meals to make for your family. Not that I haven’t been bringing you quick and easy for a while now. A new baby and busy life tends to consume me. 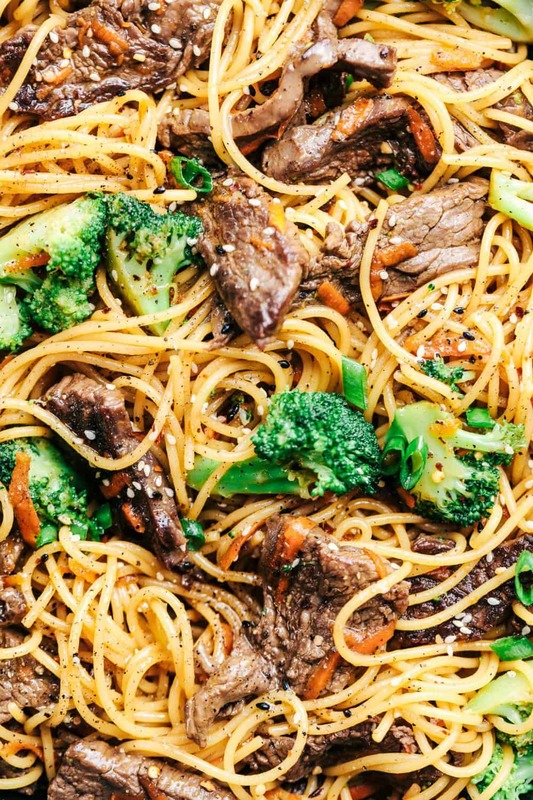 But I love making easy meals that don’t require a lot of effort that are absolutely delish! This is a family favorite of ours. 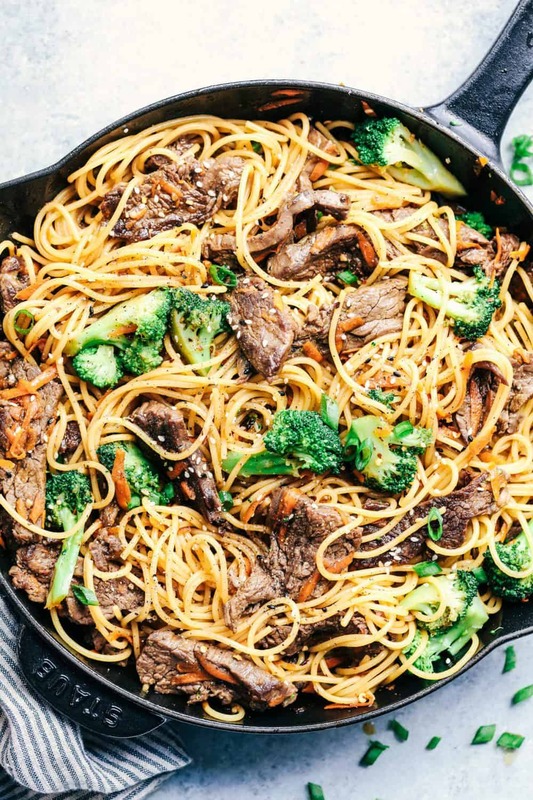 The beef and broccoli combination are one of our favorites and my kids are a huge fan of noddles. This is THEE perfect meal to make for your family and especially for the busy back to school time. I put this meal together in 15 minutes, but I wanted to give an extra 5 minutes to those that aren’t trained in super fast I have a baby crying skills. This is the perfect meal in one and I know that you are going to love it as much as we did! 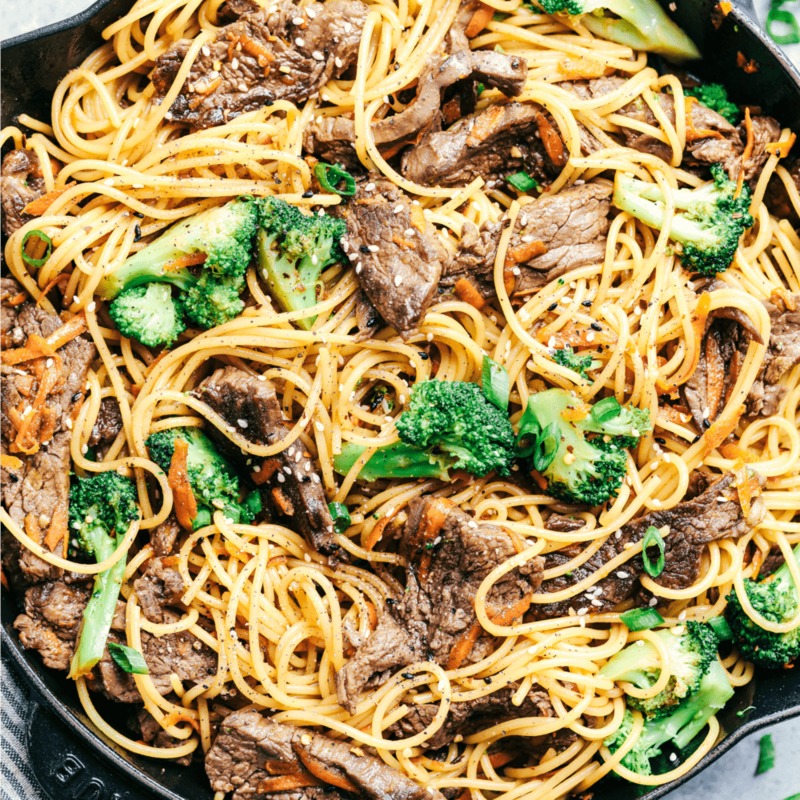 While the pasta is cooking, add olive oil to a medium sized skillet. Cook the steak until no longer pink. Add the garlic, and carrots and cook for a minute more. In a small bowl whisk together the brown sugar soy sauce, hoisin sauce, sesame oil, ginger, red pepper and pepper. Add the spaghetti to the skillet and pour the sauce on top and toss until incorporated. This dish was FABULOUS! I used sirloin steak. Cannot say enough about the flavor – .so very good. I used lo mein noodles. I’m a fan now. My husband and I will make this a regular dish for sure. Excellent recipe. I love it and I’m sure my family will too. Thank you! This is delicious. I have also substituted chicken for the steak. It always gets rave reviews. Easier and cheaper than take-out! This is one of my go-to recipes. This recipe is really good. The sauce is delicious. I doubled the sauce. and I added more vegetables – zucchini, onion, mushrooms, red pepper, and water chestnuts. I added some fresh ginger when I browned the beef. Really great recipe! The sauce is delicious. I doubled the sauce and added more vegetables – red pepper, zucchini, onion, mushrooms, and water chestnuts. I added fresh ginger when I cooked the beef. I’m excited to try the recipe. It’s hard to get a decent print out of it without a printable version. I don’t need a 27 page print out of your entire post. Printable versions are so much handier. Just click print where the recipe starts. Try using the Paprika app! You can copy and paste recipes like this and it saves them nice and concise in your phone! This is an excellent recipe .It was easy to follow and so delicious but for the sauce you only need half the amount. Yummy! I made zoodles and spaghetti on the side and doubled the recipe. This will be in the dinner rotation. Next time I will add less sugar and more vegetables. I had a leftover steak to reimagine and this recipe was perfect. I just threw the sliced steak in after the carrots and garlic were soft to warm it up. I tweaked the sauce by reducing the brown sugar to 1T and adding 1T of rice vinegar. With the hoisin sauce, it was already plenty sweet. Anyway, my people ate this up. Just made this and it was amazing! Highly recommend! Couldn’t find flank steak here in the UK so used thin sliced sirloin but was still delicious. Will definitely make it again and it wasn’t expensive at all! Still have left over ingredients so only need to buy steak next time. I tried this the other night and it was a huge hit! do you think I could use venison instead of beef? We loved this recipe and am making it again Monday night! Trying this tonight! How many will it serve? This dish can typically feed four to six. I hope this turned out great! Please let know what you think! Thanks for following along! I am so glad that you like it! Those are great additions. Thanks for following along with me! Nutrition facts for this recipe ? I like to use skinnytaste.com or myfitnesspal.com for any nutritional information. Hope that helps you! This was SO delicious! I just used 1 less tsp of sesame oil because I find it typically salty and I doubled the red pepper for extra spice. My husband ate his whole bowl including the broccoli, which he typically avoids at all costs! Definitely adding to my regular meals! I don’t know what I did wrong. First time I made it the sauce was super thick and spicy. This time I made it again with same ingredients except swapped steak for chicken. It had no flavor. Sauce was watery and lacked flavor or spice. Chicken was rubbery and dry with no flavor. Help! I want to like this recipe again. I don’t know what to do next time. I tried this tonight with Rice Noodles as my daughter has Celiac’s. The picture looks like it includes scallions and sesame seeds but the recipe doesn’t call for either. Disappointed to find out that Hoisin Sauce has wheat in it and therefore, I couldn’t add it. Still fairly flavorful. It was a big hit with my other daughter. When I do it again, I will use a different kind of rice noodles. I used a linguini type,very flat. HI Eileen, I don’t normally reply to comments but my mum has Coeliacs too, and I make this for my family GF all the time so I thought I’d share some tips! it was amazing me and my husband ate so much! what is the serving size and calories etc for this though I can’t seem to find it. How come the picture shows scallions and sesame seeds, but the recipe doesn’t list them? 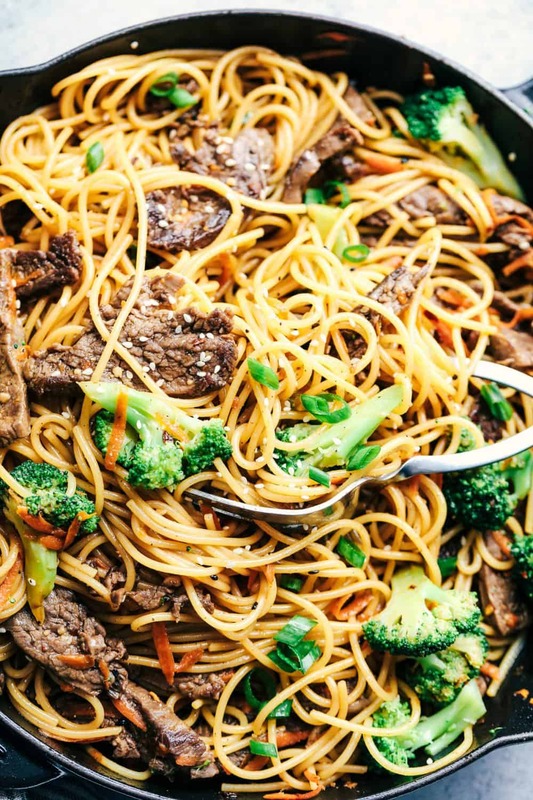 The scallions and sesame seeds are an addition to the meal you are welcome to garnish the lo Mein with. Hope that helps!